The Destroyer again walks the land. In the four corners of the world gates to the planes of Fire, Air, Earth, and Water have opened and denizens of those realms are sweeping across the lands. Lead a band of rugged adventures on a most perilous mission to save the world. This is not necessarily an adventure just for Knights, and Clerics, you may need to enlist the aid of the darker races such as, Trolls, Dark Elves, and Minotaurs. Save the kingdoms from ruin or watch as the lands are decimated forever in Might and Magic VIII. 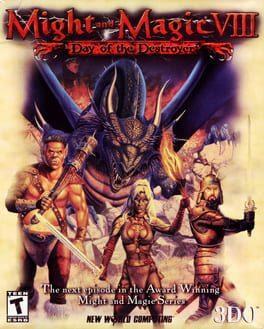 Might and Magic VIII: Day of the Destroyer is available from 3.99 to 3.99 from 1 shops.